Since the summer of 1977 it's been the most tumultuous debate in geek culture. Which franchise is superior: Gene Roddenberry's optimistic idea-driven utopia or George Lucas's scruffy, swashbuckling ode to the adventure serials of yore? 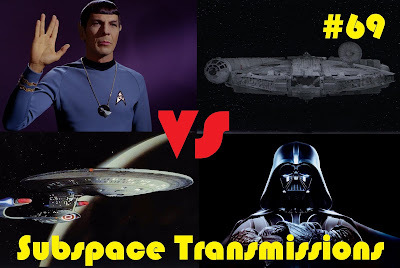 Well, with The Force Awakens mere days away, and Star Trek Beyond soaring into theatres this summer, it's high time to settle this fiery argument. Hence, this week hosts Cam Smith and Tyler Orton, along with returning guest David Borys, are throwing down the gauntlet and pitting these two titans against each other in 12 grueling competitive categories. Which franchise boasts the best heroes and villains? Aliens? Philosophy? Expanded Universe? Storytelling? Two will enter, but only one can emerge victorious. So don't miss out on this high spirited conversation that's guaranteed to inspire passion no matter which side you come down on! Wanna appear on the show? Shoot us a 30 to 60-second audio clip telling us where you come down on the classic STAR TREK VS. STAR WARS debate and you could take the spotlight in an upcoming program! You can also send any other questions, topic ideas or feedback to subspacetransmissionspod@gmail.com!